I have spoken with many facilities managers and maintenance professionals over the years, and I repeatedly hear the same challenges. One common challenge involves the energy efficiency of commercial boilers. Today, most people understand that an efficient boiler contributes greatly to an efficient facility. But sometimes, the boiler output does not align with the amount of energy being used which negatively impacts overall facility energy loss. When this happens, many professionals will recommend purchasing a new, more efficient boiler. Understanding the factors that contribute to boiler efficiency can help determine whether replacing the boiler is truly the most cost-effective course of action. We can start the conversation about boiler efficiency by talking about fuel-to-steam efficiency, which is a measure of the overall efficiency of a boiler. Fuel-to-steam efficiency accounts for the effectiveness of the heat exchanger as well as radiation and convection losses. Radiation and convection loss happens to all boilers. These numbers represent the heat that radiates from the boiler as well as heat loss due to air flowing across the boiler. Radiation and convection losses, expressed in Btu/hr, vary between different boiler types, sizes, and operating pressures. In most mechanical and boiler rooms, the boiler and fittings such as elbows and tees are insulated. However, the components are often either partially insulated or completely bare, which wastes energy. They require periodic maintenance that involves removing existing insulation for access. It’s easy to overlook insulating pipe components when thinking about boiler efficiency and facility energy loss. 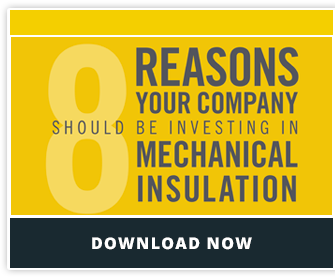 There are often many other factors that facilities managers and maintenance professionals consider first before they look to insulating mechanical equipment. But with the help pf an insulation contractor, the challenge of insulating pipe components is minimized and there are several viable options that can be considered. Radiation and convection losses are a significant part of the overall boiler efficiency equation. If you believe your boiler output isn’t aligned with boiler efficiency, mechanical insulation may be the answer.